I am convinced everyone should have a good banana bread recipe. It was one of the first things I learned how to make when I left home for college because it was like having a little piece of home with me! It is also a super resourceful way of using bananas that have gotten too ripe. A few other simple ingredients and you have a great breakfast addition! 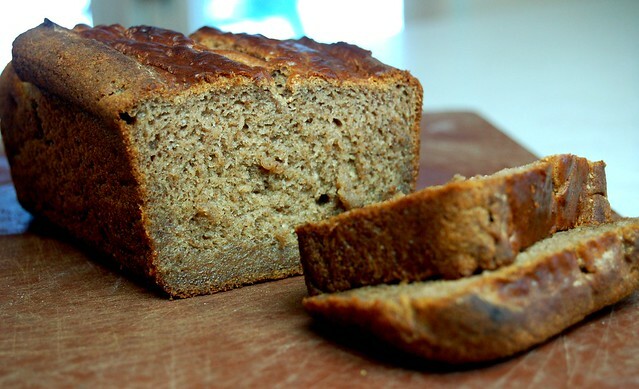 I can’t tell you how many banana breads I have made over the years to make one that reflected not only the taste I remember from home, but also the texture. Once I went gluten free and committed to using cleaner ingredients, I had to change up the recipe I had been using. I spent a period of time grain free for gut healing and while grain free banana breads taste pretty good, the texture was always on the drier side since coconut flour is quite dense. Once I was able to handle grains again I created a recipe similar to this but with eggs. I now have a nephew that has a severe egg allergy so I like to have staple recipes like banana bread figured out egg free! It was pretty easy to make banana bread egg free since bananas make great binders – just take out the eggs, and add a couple more bananas! It works great! So here is my family’s banana bread! Dump everything into a blender or food processor, into a loaf pan, and into the oven! SIMPLE! Everyone should have a good banana bread recipe up their sleeve. I find this to be the perfect gluten-free version. Blend the banana, butter, milk, lemon juice, and sucanat in a food processor, blender, or with hand held beaters. Bake at 350 degrees in a small buttered (or coconut oiled) loaf pan for 60 minutes. Let the loaf cool a good 15 or so minutes before cutting. I usually slice the whole loaf and freeze some –quick pull out addition to breakfast or lunch! 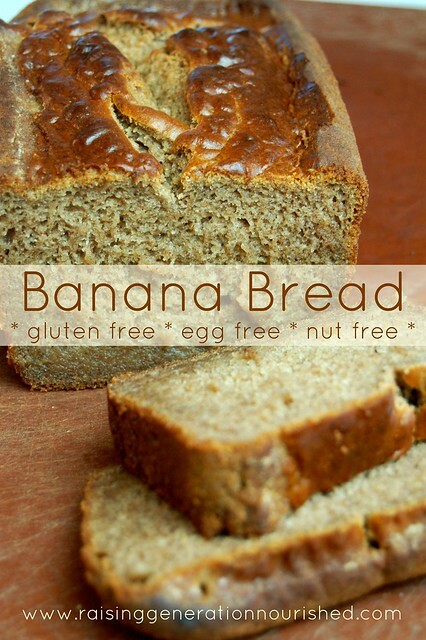 You could also do a double batch if you have enough bananas and just freeze a whole loaf. 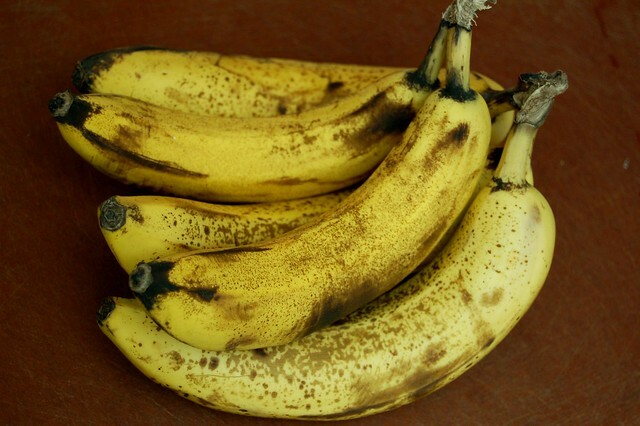 Ever see those over ripe bananas go on super sale at the end of the week at your local grocer? GRAB THEM UP! Bananas are a pretty frugal fruit anyway, but when they are even cheaper after they go too ripe at the store, you can double up some banana bread loaves for the freezer for cheap! I usually serve banana bread with our breakfast. 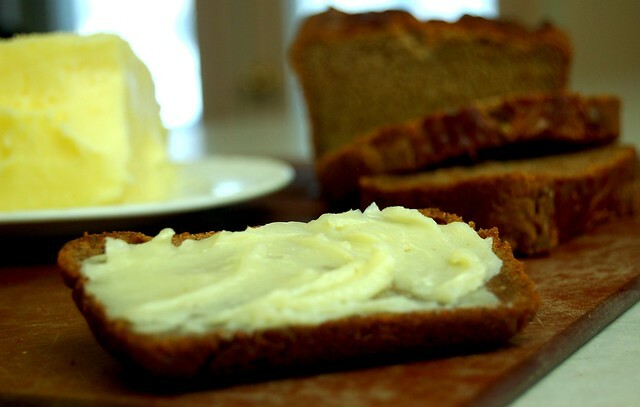 I spread coconut butter or butter on the banana bread and serve it with raw milk and a fried egg or bacon. It is also a great option for adding onto lunch. Especially if you are a gluten free house, GF breads at the store are pricey and just not in our budget. 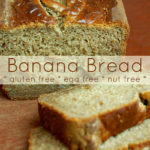 Banana bread is a fun option to take the place of a sandwich here and there. You really could do this up on a school morning. The night before get the loaf pan buttered and get all the dry ingredients measured out. In the morning just add the wet ingredients to the blender, add the dry, and into the loaf pan! It can bake while everyone gets ready for school! This a great one to quick do up for a new mama that you know! Bring her over a frozen loaf for her freezer *before* baby comes! That way she has something quick to pull out during those first days with baby. You can get sorghum flour , tapioca flour , and white rice flour on Amazon – usually this is the cheapest for me, although I price check occasionally at our local health food store and sometimes it is better there. Let me know if you try it out and if it passes the kiddo test! This post was shared at Real Food Wednesday, and Allergy Free Wednesdays! We loved the bread! The only thing is that it is not baked all the way on the bottom. I had it in for 60 min. Maybe it needs more time in the oven? Hi Nilla! Yes it sure sounds like it could use more time. What size loaf pan did you use? And what kind – I should have probably mentioned mine is a glass loaf pan – I bet that changes the bake time if you are using something different. And its a small loaf pan. Thank you for the feedback! I also used a glass pan. The size is 8.5×4.5×2.5. Ok great! Well the next thing to try would just be more time in the oven – maybe our ovens run a little different. I really should get a thermometor inside my oven sometime to see how accurate it is when I’m setting it. Also, just be sure when you take it out of the oven you let it rest for a GOOD 15-ish minutes or so. It continues cooking for that long outside of the oven and this is especially true with gluten free baking for some reason. Let me know if that helps! Or, maybe Nilla’s bananas were larger than Renee’s They do tend to vary greatly in size. Five bananas could be as little as a cup, or as much as a cup and a half or more. Having some idea of cups worth of banana needed, would be helpful. Thia that is a great point! Thank you! I will measure them out next time – I have never thought of that – I usually don’t buy huge bananas since my girls like to eat them -so I would say medium in size but I will definitely measure the amount of banana mash next time! Renee, do you have other bread recipes that are easy like this one? I have many food allergies and it is nearly impossible to buy breads that are in health food stores. I baked some but they never come out right and dont taste very good. It would be nice to have bread again. I will be trying this recipe tonight!! Thank you. I had no idea you could swap bananas for eggs 🙂 Great recipe, can’t wait to munch! Thanks for sharing! This recipe looks so good! I can’t wait to try it. I don’t have any sorghum flour. Is there something I can use instead? Hi Karla 🙂 Yes brown rice flour swaps good for that. I don’t know what happened but this bread didn’t workfor me. I baked it for 70 mins and let it sit for over 15 and it still not done. 🙁 I am not sure what went wrong. Is it 1 cup of white rice flour? The recipe just says “1 white rice flour.” I am so excited to try this recipe and want to make sure I am using the right measurement so it comes out as intended. Thank you! Hi Stacie! Wow! Thanks for catching that! Yes 1 cup! I will go in and change it – man that has been up forever and I have never caught it! Hi Renee! Thank you so much for this great recipe. my son has numerous food allergies and on top of his limited diet he is a picky eater. But he loved the banana bread! Do you have anymore recipes?! Hi Stephanie! That’s great! Yes I do! If you hit the “Recipes” tab at the top of this site you can see a break down of all the recipes on the blog from breakfast to dinner and everything in between! Could you make these into muffins or mini muffins? Is there a general rule for converting from one size to another when it comes to temperature and time. My son is 21 months and would enjoy picking out and holding the muffin himself. Hello could you substitute the flour you used for quinoa flour and coconut flour do you think the recipe will work?? Hi Karizma! I have not tried that but I would imagine you would definitely need to adjust some of the recipe. 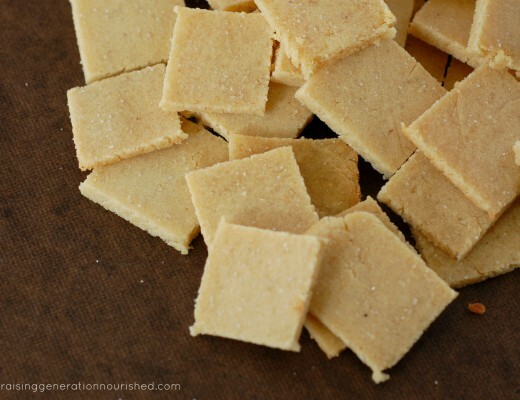 Coconut flour in particular is super absorbent and just really behaves differently in baking. You will most likely need more moisture and binding. I don’t bake with quinoa flour very much as well so I’m not sure what that would need to make it work. I’m sorry! Best bread ever. I didn’t have enough bananas, so I added 2 handfuls chopped dates. Oh I bet that is amazing Paula! Thanks! I cannot STAND the metallic aftertaste of sorghum and not thrilled w using tapioca flour…I read the brown rice flour sub. You suggested, but can you tell us why you choose to use sorghum flour in the first place? I will try it with coconut flour and the brown rice flour as well I’m just wondering the advantage, as I see it used in so many recipes and really don’t care for it …thank you for your great ideas ! Sorghum flour is a good source of protein and minerals and lends more softness than a rice flour/coconut flour combo. I hope what you try out works for you!